WASHINGTON — The Lynx 41 infantry fighting vehicle made its public debut in the springtime drizzle at a Parisian land warfare exposition in June this year. 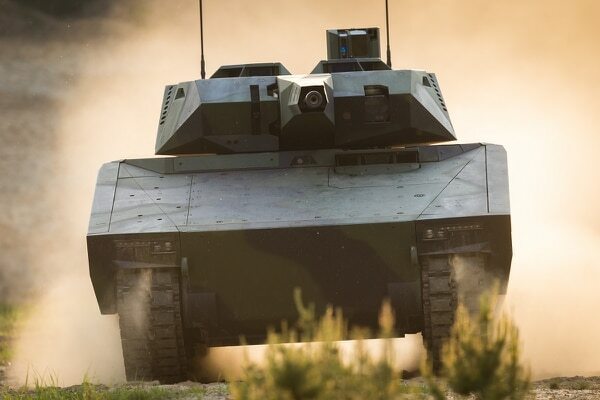 German defense company Rheinmetall took pains to show its vehicle on scene was not a mock-up, but a real vehicle that came with available footage of its rigorous test campaigns. Ben Hudson, the head of the company’s vehicle systems division, told Defense News at the expo that Rheinmetall was “highly interested” in the U.S. Army’s Next-Generation Combat Vehicle program, and said to stay tuned on how Lynx might break into the U.S. market as a serious competitor for NGCV. Fast-forward four months, and Rheinmetall has found a high-profile partner in Raytheon to bring Lynx to the U.S. They will participate in what is shaping up to be a competitive prototyping effort with the NGCV program, to replace the Bradley Infantry Fighting Vehicle with an Optionally Manned Fighting Vehicle. Developing a family of next-generation combat vehicles is a top priority of the U.S. Army as part of its modernization strategy focused on multi-domain operations. In fact, it’s the second highest priority, underneath bringing Long-Range Precision Fires into the force. The partnership gets after “essentially the best of both of our companies,” Hudson said. A German contractor has nabbed more business under the multibillion-dollar Australian land forces modernization program. 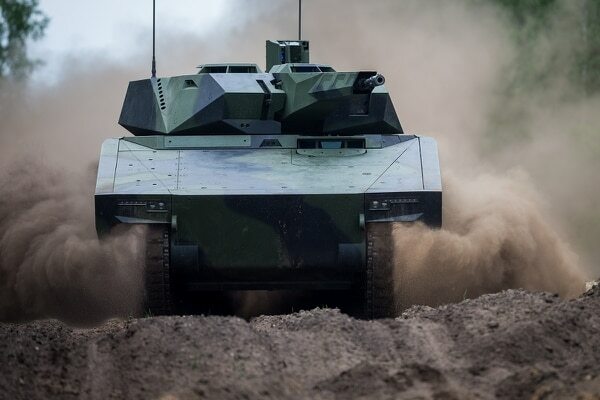 It “brings together the world’s leading infantry fighting vehicle technology, the vehicle and turret from Rheinmetall,” with Raytheon’s capabilities from a systems integration standpoint, he said. “A lot of the gaps that we had in our business to really create that next-generation solution are easily covered by the strengths and capabilities Raytheon has, and some of those things are electronic warfare, signals intelligences, missiles capabilities … and sensor systems like the third-generation FLIR that are a key plan of the Army going forward,” Hudson said. To bring on Raytheon’s technology, the vehicle won’t have to be changed much because it was designed from day one to be modular and adaptable. In fact, the company switched configurations at Eurosatory to a hybrid command variant in a matter of hours. The vehicle will be “a U.S. product, U.S. made and, ultimately, we will move to a U.S. engineered platform,” Hudson said. The fact that the Army is ready to dive head first into replacing the Bradley, with plans to have companies compete for a chance to rapidly build prototypes for the OMFV program, makes the partnership with Rheinmetall attractive, said Kim Ernzen, Raytheon’s vice president of land warfare systems. Because Lynx already “exists, that is one of the most compelling pieces to this relationship,” she said. But Raytheon and Rheinmetall also share the same philosophies when it comes to company culture and innovation and “how we look at technology that comes to play not only today but, more importantly, has that growth path for the future,” Ernzen said. This aligns with the Army’s path to get a next-gen combat vehicle to the field quickly but continue to evolve its technical capabilities to keep pace with evolving threats. This isn’t the first time Raytheon and Rheinmetall have partnered on programs. Most recently, the pair unveiled an integrated suite of air-defense capabilities they think could meet the entire portfolio of German air-defense needs, going up against Germany’s current development plans to buy a missile defense system from Lockheed Martin. And the duo has also worked to integrate Raytheon’s Patriot air-and-missile defense system on Rheinmetall trucks for an unnamed Scandinavian country, among several other efforts. The impact of emerging threats and new requirements drove Rheinmetall to build Lynx to fill a gap in the market. Defeating today’s and tomorrow’s threats means having a vehicle that weighs well above 50,000 kilos — or more than 110,200 pounds — or one that is rapidly reconfigurable to support different missions. The Lynx KF41 with a Lance 2.0 turret “rebalances the key requirements in the areas of survivability, mobility, lethality, capacity, adaptability and transportability,” Hudson said in June, and is reconfigurable using open-architecture systems and a modular and open mechanical architecture. The vehicle design is “highly scalable,” Hudson said, with more than 18,000 kilos, or more than 39,000 pounds, of reconfigurable payload and an internal volume that allows for the turret and up to nine seats in the back. The new vehicle is fitted with an 850-kilowatt power pack that uses the Liebherr engine and Renk transmission. Additionally, in order to power the digital backbone and all the other weapons systems, more than 20 kilowatts of electrical power is stored on board. The turret also has two flexible mission pods on either side, to allow customizable subsystems such as anti-tank guided missiles, non-line-of-sight loitering munitions, UAVs or an electronic warfare package. Raytheon will provide the third-generation FLIR, fielded on Abrams tanks and also meant for the Bradley A5 upgrade, which has since been canceled to make way for the OMFV. The company also plans to provide other sensor suites, particularly an active protection system that is already being developed and built to be compliant with the Army’s future APS system. While Rheinmetall has its own APS — the Active Defense System — that it’s been trying to break into the U.S. market as an interim solution for combat vehicles now, the company sees Raytheon’s APS offering as “unparalleled” and the plan is to incorporate the capability into the offering. Raytheon and Rheinmetall plan to submit a proposal when the Army’s draft request for proposals drops — potentially as soon as this month, but it could slip to November or December, according to Ernzen. Proposals are due in May. The Army plans to follow a similar procurement route as it did with the Armored Multi-Purpose Vehicle and downselect to two competitors who will build 14 prototypes in an engineering and manufacturing development phase in the first quarter of fiscal 2020.